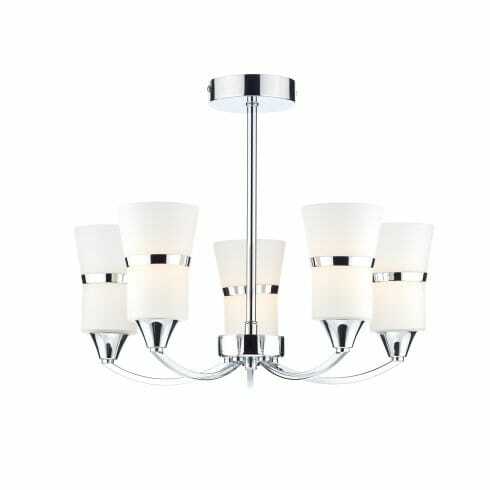 Dar Lighting Dublin medium 5 light ceiling fixture displays a circular ceiling plate with a slender stem that supports five curved arms topped with bowed, opal glass shades. These shades emit a warm and inviting glow of light when illuminated, and the stylish metal trim compliments the rest of the polished chrome frame. The product code for this Dar ceiling pendant is DUB0550/LED. A simple, sleek and elegant design that will compliment almost any modern decor, while its medium size is ideal for a range of ceiling heights. Complete with LED lamps that provide very long lasting, bright and energy efficient lighting. The range also showcases matching smaller 3 and larger 8 light chandeliers and a single light wall fixture to create an extended look throughout your home. A more traditional antique brass finish is also available and all fixtures can be ordered from our website.